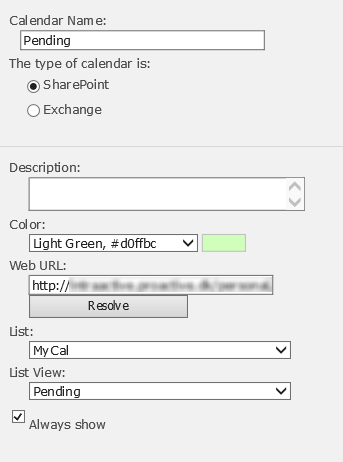 I have SharePoint calendar and I want the entries to be in color based on status. If user add one entry and status is initially pending then that task would be in green, later it get changed to in progress then task color should change to yellow and blue for resolved. Create three additional views Pending, Progress and Resolved which only show items in the appropriate status. Change the default view to only show Status = "None". In the "Calendar Tools|Calendar" ribbon tab click "Calendars Overlay"
How can I set different event color that are fetched from SharePoint list?